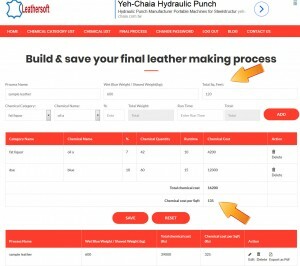 Online Leather Making Process That Calculates Costing Per Sq. Ft. I feel myself among few blessed ones who chance to get highly established & helping college seniors. It’s my seniors’ enormous support and inspirations those made this Leathersoft project to come alive. Through these supports only new & required features have been added to make it compatible with the industry. One of the added new features is “figuring out the chemical costing per square feet of the whole leather surface area”. 1. 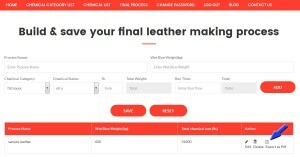 Chemical Database : While incorporating “Leathersoft” in your leather making process, as usual, you will build up your own chemical categories and chemicals database along with their prices. 2. Final Process : While computing the final process for your crust leather or wet blue out of your saved chemicals one additional field is served to you and that is the sq. ft of your total leather surface area. During developing the whole process you have to mention the sq. ft. at stipulated box and the total chemical cost and cost per sq. ft. will be automatically calculated. In leather process technology figuring out the cost involved in chemical usage is not an easy job. 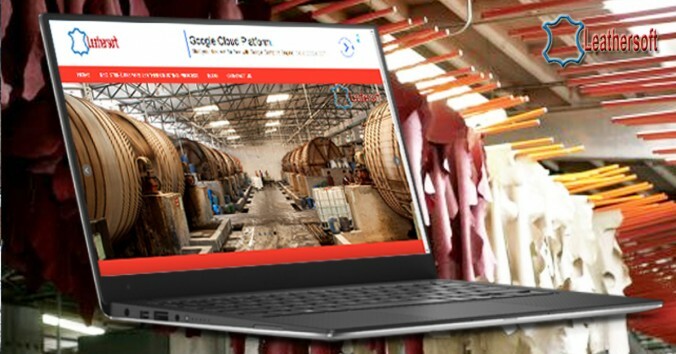 But using leathersoft free online tool chemical costing can be smoothly done without any hassle for a major part for leather processing. For beamhouse & crusting process where use of drum is involved leathersoft can be easily deployed to calculate your chemical costing automatically. You just need to build up your chemical database with prices. For beamhouse operations its based on pelt weight or for crusting operation its based on wet blue weight, all your chemical costing is automatically done while preparing the process chart for the operation. Following is a discussion on Leathersoft in Quora. Excepting beamhouse and finishing operations the most elaborate & tedious part of leather making is its crusting process. Multitude of chemicals are incorporated in diversified combinations to give birth to variety of leather types. 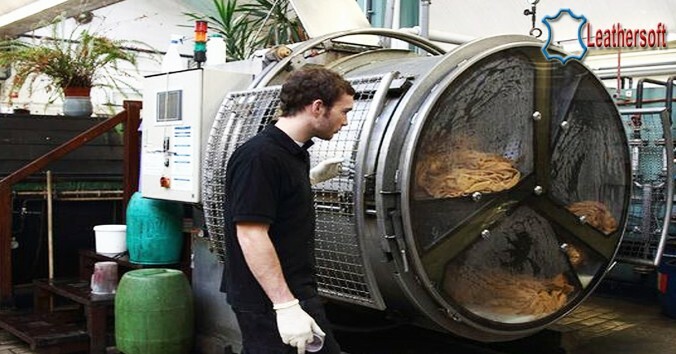 Above everything documentation of these enormous quantity of generated processes used for experimentation is another big concern for Leather Technologists. Leathersoft brings a very easy solution to this tedious process. 1. 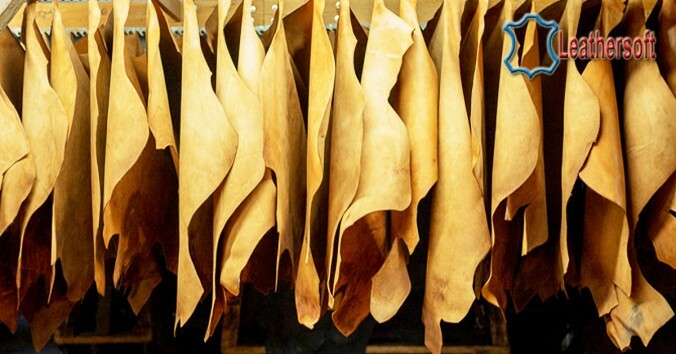 For calculation and documentation of leather crusting process one can easily use a spread sheet. But maintaining a huge chemical database for an individual is not a practical proposition using a spread sheet. Accessing the database as well as your processes in required format over internet from anywhere is another challenge. You can argue that “Google Drive” can be used for personal account and creating the spread sheet involving all the calculations and may be by maintaining the chemical database too. But its learning process is steep. Leathersoft is giving you a ready solution for the whole thing. 2. Leathersoft can be your personal office anywhere. On registering an account you are getting to maintain a whole chemical database of your own and which is never accessible to anybody else. 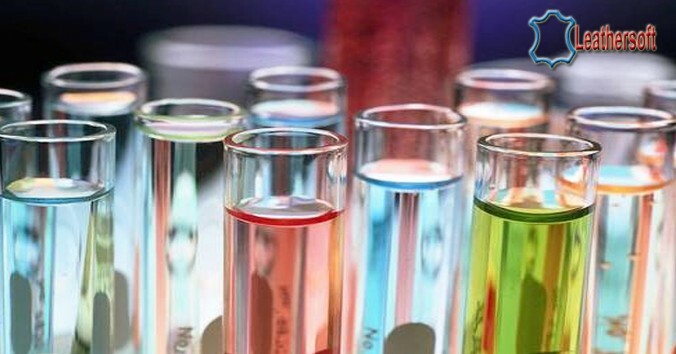 Not only the chemicals but the categories those chemicals belong to also can easily be maintained by you. You are only adding the required wet blue weight. Then just by calling those chemicals in a drop down from your own database and mentioning the percentages your whole crusting process and the chemical costing is ready. 3. Documentation is on your finger tips. After your crusting process is ready, save your process & hit the export button. There you are. Soft copy of your process is ready as pdf file. 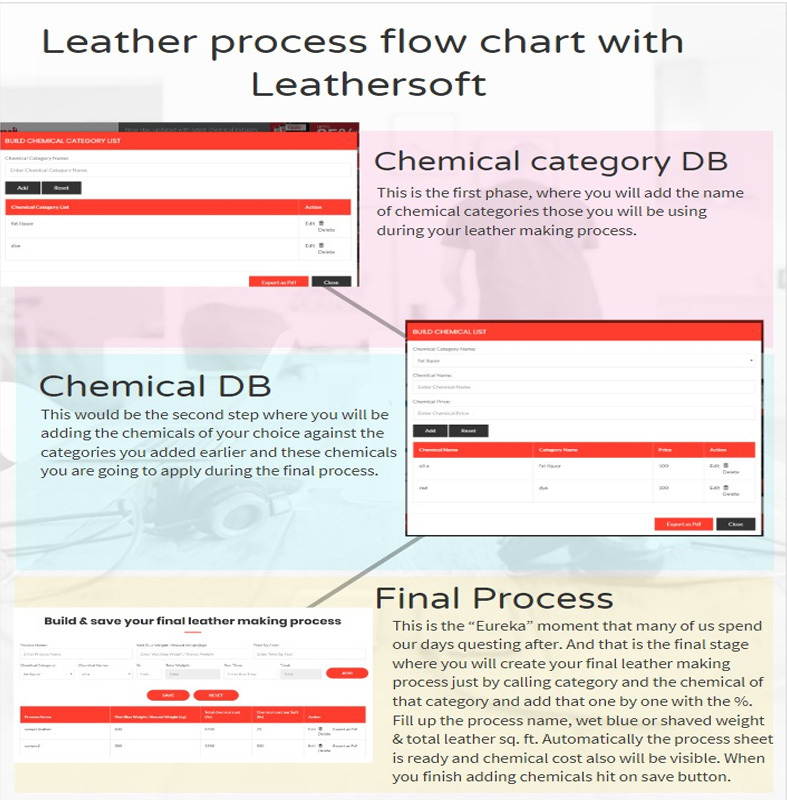 Leathersoft is an online tool to prepare & document leather crusting and pre-tanning process carried out in drum and to figure out the chemical costing for that. The following video depicts how to use Leathersoft.co.in for preparing & documenting leather crusting process.